How fast can your organization change? How long does it take to adopt new technology? Do things run the same when you bring in a new leader? How does the culture evolve with new acquisitions? There is an underlying thread in all these questions. Workplace attachment or our instinctual (biological) response to attach to both tangible and intangible objects continuously throughout life. 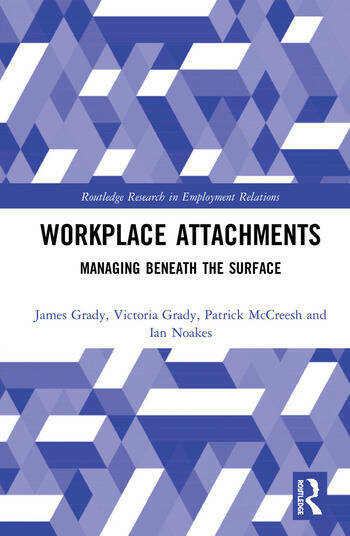 Workplace Attachments: Managing Beneath the Surface provides the first comprehensive review of attachment in the workplace. We explore the biological and evolutionary roots of our attachments, explain how you can find attachment behaviour in your workplace, and help you proactively understand attachment behaviour with your team. Our practical research, case studies, and story-telling will help you understand how attachment behaviour impacts you, your employees, your peers and ultimately the culture of your organization. Once you understand how people attach, detach, and re-attach to objects and elements of your organization, you will be able to real and lasting change. Chapter 6- Leadership and Attachment Styles: I Will Follow Who? Chapter 8- Transitional Objects and Attachment: Where Do You Find Support? Dr. James Grady is co-founder of PivotPoint Business Solutions LLC, a niche consulting firm focused on transforming employee resistance into proactive change strategy. Dr. Grady’s interest in human behavior originated in a curiosity fostered by his patient experiences during 40 years as a provider and managing partner of an outpatient oral/facial surgical practice. Dr. Victoria Grady is currently an Assistant Professor of Management/Organizational Behavior in the School of Business at George Mason University. She continues to build on her original research defining the unique application of Attachment Theory to organizational change, leadership and culture. Dr. Patrick McCreesh is a co-founder of Simatree, LLC, where he leads the strategy and analytics consulting practice. Dr. McCreesh serves as adjunct faculty at Georgetown University School of Continuing Studies and George Mason University School of Business. Mr. Ian Noakes is a business consultant with specialiazations in change management, product development and product marketing. Mr. Noakes has delivered several public presentations on attachment at Association of Change Management Professionals (ACMP) Annual Conferences in the USA and the Change Management Institute (CMI) in the United Kingdom.